My trip to explore the iconic culinary destination of Thailand was a little different than my usual trips. First, I was accompanied by my entire family, which always means five opinions on everything. Second, we had done what our family never does—we went with a tour group. Having been avid and independent travelers our entire lives, the idea of being herded around and told what to do for a week by a tour guide working off of a commission was not our ideal vacation. However, we had spontaneously found a great deal and decided to go with it. Just as many people view Thailand as a “gateway country” into exploring the rest of Asia, Thai food is also in many ways, a gateway into Asian food. 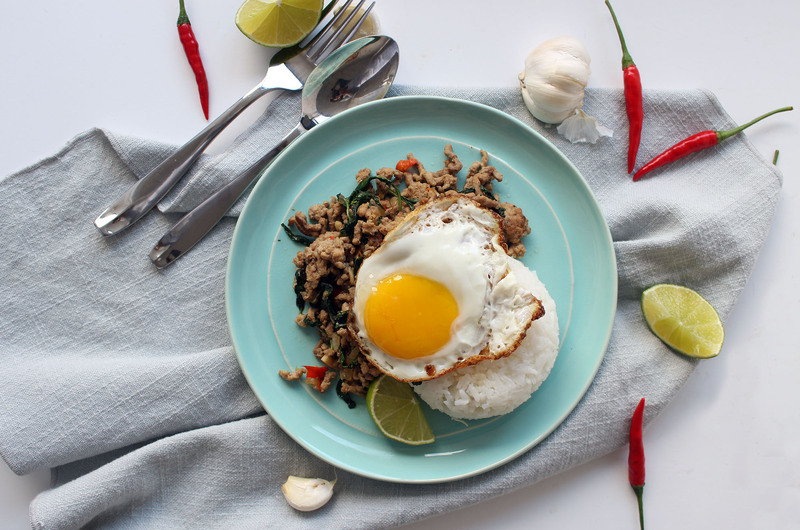 I don’t know what it is exactly, but perhaps the alleviated pressure of not needing to use chopsticks, an overabundance of peanuts, and an exotic-yet-familiar sweet and spicy balance has made North Americans embrace Thai food as part of the mainstream. As long as there are red chilis, thai basil and lime, it could very well be Thai. One of my favourite dishes that incorporates all of these ingredients is Pad Gra Prao (also spelled Pad Ka Prow and a few other ways). 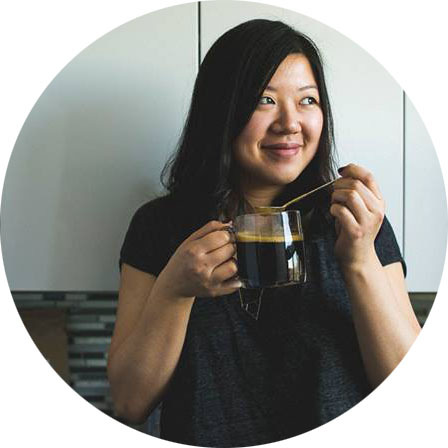 It’s a simple stir fry made with pork, chicken or beef (we are using an excellent medium-fat ground Ontario pork in today’s recipe) that packs a lot of flavour. There are many people who argue that this dish must be made with Holy Basil to be authentic, but unfortunately, Holy Basil is very hard to find in North American grocery stores. 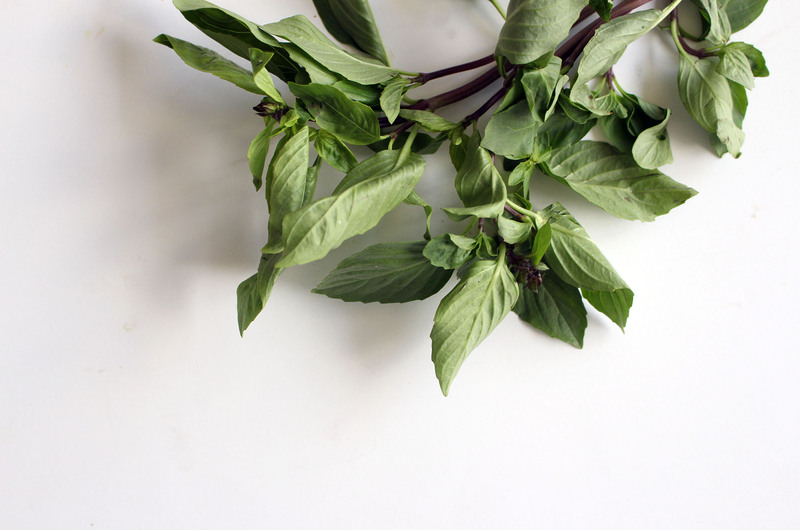 There are other people who argue that Thai basil, being more fragrant, is a better choice anyway. My (somewhat unkosher) solution? A 60-40 split of sweet Thai basil and lemon balm. Lemon balm has the texture of Holy Basil and adds another fragrance dimension that takes this dish to a new level. After all, improvisation is what led to the birth of many of the best Thai dishes in the first place! Please, just avoid using Italian basil for this dish. Loosely chop the bird’s eye chilies. Peel the garlic and smash each clove with the back of a knife. 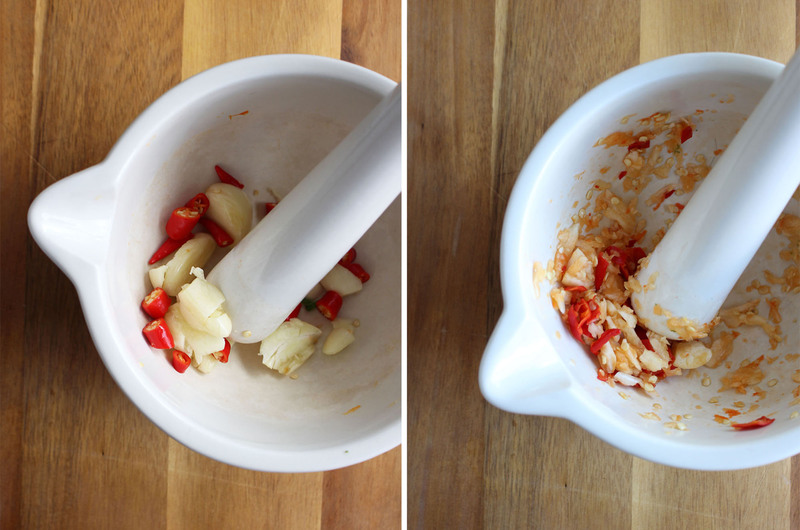 Mince the two ingredients together with a mortar and pestle until you’ve formed a loose paste. Heat a tablespoon of the oil in a large wok over high heat. Add the garlic-chili paste and shallots and stir fry for about a minute. Add the ground pork and stir fry for another 5 minutes or until most of the juices have been re-absorbed. Add the soy sauce, oyster sauce and fish sauce and cook for another 2 minutes. Remove the basil from its stems (and lemon balm if you choose) and add both of the herbs into the wok. Do not worry if it looks like a lot—the herbs will shrink down very fast. Stir fry for another 3 minutes before removing from heat. In a separate frying pan, add about 1 tbsp of vegetable oil and get the pan screaming hot (a drop of water should sizzle if dropped in). Carefully crack the egg into the pan and fry for 2-3 minutes or until the edges of the egg are crispy and the whites have solidified. 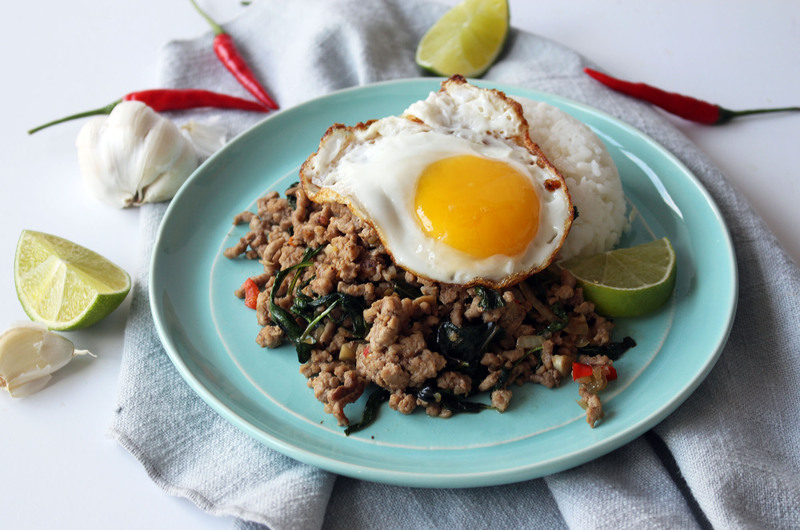 Serve the Pad Gra Prao with white rice on a plate and place the crispy egg on top. 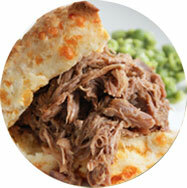 Add a lime wedge for garnish.